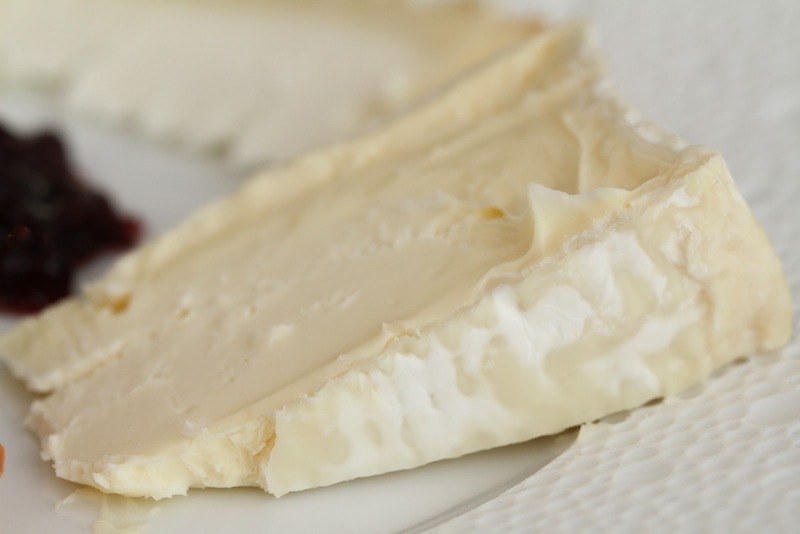 For a cheese to be considered “triple-cream” it needs to have a minimum of 75% fat in dry matter. Double cream cheeses range from 60-74% fat in dry matter. To obtain this higher fat-content, already rich whole milk is bolstered with cream, creating a decadent texture that is nearly like eating butter. Before you blanche at the fat content, keep in mind that just as with the percentage of cacao in chocolate – the percentage of fat in dry matter is not telling the whole story in a cheese’s nutritional makeup. Double and triple cream cheeses tend to be younger (which is also why we can’t bring unpasteurized versions into the United States- but that’s another story.) As younger cheeses, they have a water content that can reach upward of 50%. While the fat in dry matter of a triple cream cheese is 75% percent fat in dry matter, the total fat content hovers around only 39%; whereas butter has a total fat content over 80%. Compare that to Parmigiano Reggiano, which has a much lower water content after being aged for 16 months or longer, but a total fat content of around 30%. Bite-for-bite, the same size piece of Brillat Savarin on your cracker has only slightly more fat than the same sized piece of an aged Parmigianno Reggiano, Gruyere, or Cheddar. Double and triple cream cheeses are typically sold frais (fresh) or soft-mold rinded. Fresh versions are unrinded and can have a dense texture similar to fresh chevre (ex:Regal de Bourgogne aux Raisins or Regal de Bourgogne aux Moutarde.) Or they can be fresh and spreadable like Mascarpone. The soft mold ripened versions are seen in classic triple-cream cheeses like Brillat Savarin, Explorateur, Delice de Bourgogne, Prince de la Fontaine, and in American newcomers like Nettle Meadow Kunik. All versions are excellent served as a dessert course with perfectly ripe berries or tropical fruit, and are best washed down with sparkling wines.